If your heat exchanger is part of a critical application or if downtime for servicing must be kept to an absolute minimum we would recommend a rotating plate pack. When the heat exchanger is first serviced the existing plate pack is removed and replaced with a new set of plates and gaskets.This minimises downtime, usually 1 - 3 hours, as no cleaning or regasketing is required. The old plate pack is removed to be cleaned, regasketed and held ready for the next service. When the heat exchanger is next serviced the process is repeated. The existing plate pack is removed and replaced with the refurbished plate pack, once again downtime is kept to just a few hours rather than the 1 - 2 weeks that would normally be required to refurbish the plates. This method of plate pack rotation is particularly cost effective if you have several heat exchangers on site that have identical plate packs, as just one rotating plate pack can be used to service many heat exchangers. In critical applications unexpected heat exchanger failures can cost thousands of pounds for every day the heat exchanger is not running. Adopting the rotating plate pack system means you have a spare plate pack ready to install in the event that a heat exchanger fails unexpectedly. This can be vital, especially as the lead time for spare parts can be several weeks for some heat exchangers, particularly obsolete models. The normal plate cleaning process downtime may be kept to 1 week assuming all the plates pass the dye penetrant test but what happens if some of the plates fail? If new plates are not available from stock your downtime can suddenly change from 1 week to several weeks with dramatic consequences. Having a rotating pack gives you precious time to replace any plates that have failed whilst keeping your heat exchanger in operation. 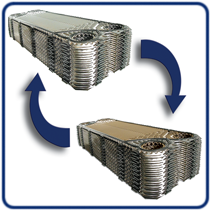 Regularly refurbishing your heat exchanger plates will prolong their life in the long run. Deposits and scale left in a heat exchanger for long periods of time may damage the heat transfer plates, often rendering them useless even after the first service. Regular preventative maintenance will ensure consistently high efficiency and maximum heat exchanger life.